I've been waiting a few months for Unibroue's À Tout le Monde to come to Manitoba but at this point I don't think it will ever come out west. I heard about Unibroue's newest beer, Miel de Lune (Honey Moon) a few weeks ago and one of the liquor store employees said "you're going to want to buy this!" as I was looking for a beer just to savour last night. 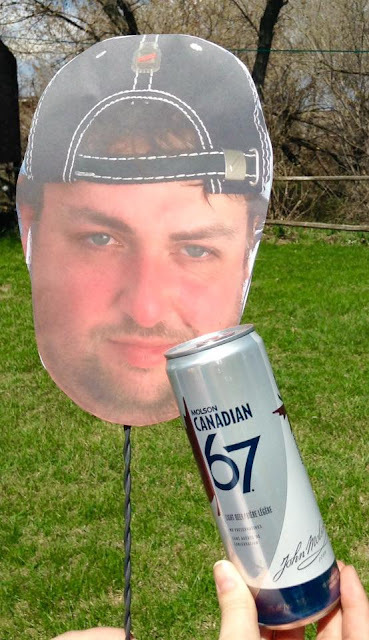 I knew the beer was going to come to Manitoba but seeing that the product isn't even listed yet on the Liquor Marts website, I didn't expect it yet. This isn't the first honey beer I've had by Unibroue, I've had their "U Miel" in the past but that one is a discount honey lager. Miel de Lune is a Belgian style amber ale inspired by the old tradition where father of the bride would give mead to his new son-in-law for the first month of marriage. Let's try out the beer! 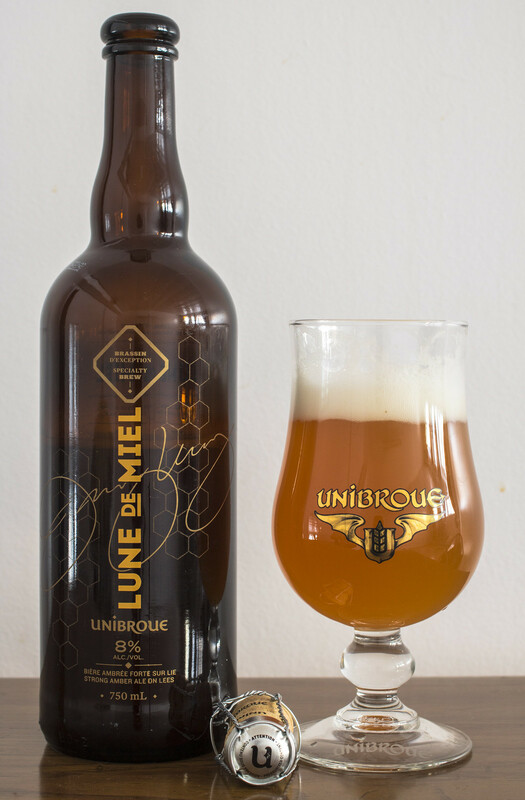 Appearance: Lune de Miel pours a bright honey orange with a thick cloudy body to it, several lines of micro-carbonation are swimming from the bottom of the glass towards the top, reaching the head. The head itself is a very thick off-white frothy head, it gradually diminishes into the body but even after leaving the beer to settle for 10 or so minutes, there's still about two and a half fingers worth of foam still on top. Aroma: You can't deny that this is a Unibroue product, it just has that smell to it. The aromas I'm getting remind me of a combination of Blonde de Chambly meets Don de Dieu, it's a somewhat pungent scent of lemon, Belgian yeast, a moderate amount of honey and a nice aroma of wildflowers - while this isn't in any way meady, there certainly are notes that remind me of various Manitoba wildflower meads I've had over the years. The beer is fairly sweet, a light to moderate grassy hop presence and a hint of peppery spice at the end. Taste: The honey is the very first thing I can taste in this beer - Right as the beer initially hits my mouth I get a sweetness I don't tend to see in most Unibroue beers. The beer is dominated by the honey at first but then I get the notes of wildflower and then notes of your typical golden Unibroue beers such as bubble gum, a doughy Belgian yeastiness, lemon, coriander, a light hop bitterness that leaves a bit of a grassy aftertaste and a hint of pepper for spiciness. The mouthfeel is very smooth and silky, reminiscent to a good white mead. Somewhat boozey but really easy to drink. Overall Thoughts: So.. what do I think? You already know that I'm likely one of the biggest Unibroue fans in the world so you should take this review with only a grain of salt but honestly.. I really really really really like this beer. It's a very sweet honey ale that is very easy to drink, has a great floral aspect from the wildflower honey. I would consider this both a dessert beer and a savouring beer. It's not overly sweet but it's certainly sweeter than most Unibroue beers (sans-Éphémère line). The aroma reminds me of Blonde de Chambly meets Don de Dieu but the taste itself is a beer of its own. At $6.99 per 750mL bottle, that's a great price.. but knowing Liquor Marts.. if this beer catches popularity, they'll likely up the price in a few months time. Nice review. Like you, I am a huge Unibroue fan. The Lune de Miel is probably the least impressive of their beers I've tried, except for the Ephemere collection (not typically a fan of fruity beers). I found this one just didn't hit the mark like the others. 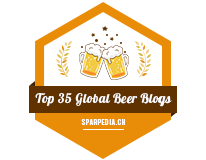 La Fin du Monde, Maudite, and Trois Pistoles are consistently good, La Resolution is great, and the Grande Reserve 17... by far my favourite.